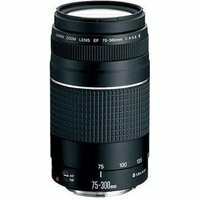 The Canon EF 75-300mm f4-5.6 III Lens is a lightweight, compact 4x telephoto zoom lens that is ideal for portraiture, sports, and wildlife photography. This lens has the same optical system, construction, and exterior design as the EF 75-300mm f/4-5.6 III USM lens however instead of having a USM (Ultrasonic Motor), it has a micro motor. The integrated AF (Autofocus) motor provides quick autofocusing performance and the Super Spectra coating featured on the lens ensures accurate colour balance with minimal flare and ghosting. As this lens features a Canon EF (Electro-Focus) lens mount, you can use this lens on a Canon full-frame camera (Such as the 1D X, 5D Mk III, 6D etc.) and a cropped sensor (APS-C) camera with EF-S mount (EG. 350D, 7D, 550D, 60D etc. ).